The anti-household tax campaign – what politics are needed? Household charges – boycott the bailout! We live in a topsy-turvey world. The Mahon Report tells us that Bertie Ahern and the heroes of the Celtic Tiger were criminals. Enda Kenny denounces him but is responsible for an even greater crime when he continues the unjustifiable guarantee to Anglo bondholders and extends it into the next generation. The household charge is one of a raft of changes, taxes, cuts and privatisations designed to pauperise Irish workers and feed our lifeblood to the bondholders. We were told that a few years pain would see the good times return. We were told that the economy was about to take off like a rocket. The Anglo deal, and the Europe-wide fiscal austerity pact, tell us our impoverishment extends into the indefinite future. The work of the campaign, the growing resentment among workers and the sheer arrogance and ineptitude of the government have combined to ensure that the capitalists now face a significant opposition. In this situation an alternative political programme becomes a key issue and the lack of democratic structures in the campaign through which political discussion can advance becomes a major obstacle. The campaign to refuse payment of household charges is the first sign of defiance and resistance since the capitulation of the trade union leadership and the collapse of trade union actions. Many activists believe that this spontaneous defiance can be converted to mass resistance but that this can only be done if we restrict the campaign to a single issue and avoid broader political questions of the austerity. Socialist Democracy believe that it is necessary to build a class conscious section of the working class able to put forward an alternative to the overall austerity programme. This debate was opened at the founding conference of the campaign when Socialist Democracy members asked about overall policy and strategy for the campaign and suggested that it had to base itself on a repudiation of the debt. There was an animated discussion involving a large number of those attending, brought to a close by Joe Higgins, who declared that the goal was non-payment, the strategy was non-payment and the tactic was non-payment. In fact the campaign is dominated by the Socialist party and the structure of the campaign copied from the bin charge campaign they set up in Dublin a decade ago – a campaign that was decisively defeated and a campaign that also set itself only organisational goals and avoided political and strategic debate. That means that the campaign, instead of narrowing in to collect signatures, should be broadening out to stage civil disobedience against all aspects of the bailout, to popularise a socialist alternative and to challenge the existing leadership of ICTU and their policy of collaboration. The history of the bin charge campaign involved a narrow focus on the bin charge as a tax to be defeated by non-payment. Socialist Democracy was denounced for suggesting that it was a charge designed to turn a public service into a commodity prior to privatisation. It is ironic that the recent tenth anniversary of this struggle saw the final privatisation of all bin services in Dublin – including a debt collection service to collect arrears! A similar weakness is shown today when water charges are described as a tax while government and troika announce the mass privatisation of all public services. This insistence on taxes suggests that the campaign is aimed generally at the community rather than at the organised working class. We ignore the fact that the collection of the household charge involves workers in its administration and that we could carry the fight to civil service workers, to An Post and to local government workers. Any discussion of the water charge would draw attention to the plan to use worker’s pension funds to install water meters in every household and to ICTU’s silent support for this privatisation – in fact for the total giveaway privatisation of all public services. It would also make crystal clear the need to fight this project through mass organisation of workers and the need to fight the union bureaucracy to build that movement. The campaign literature points out that all the money being squeezed out of Irish workers is to feed the bailout, but the major point made is about fairness. However the bailout offensive is not concentrated on one point. It affects every aspect of people’s lives. To take simply the issue of non-payment is something like an army deciding to hold a hill while the territory around was seized by the enemy. It is an invitation to be flanked and overwhelmed. The ways in which a narrow policy makes the campaign vulnerable should be self evident. The government have already taken a number of measures to threaten and frighten people and amended their policy in an attempt to detach those concerned about the septic tank issue from the household charge campaign. They are now likely to mount a major offensive, attempting mass intimidation and bringing in new laws. The campaign spends a lot of time discussing the legalities of the government’s actions. Given the criminal nature of the bailout itself we do not believe that there is any hope that the hiring of lawyers can possibly be effective in restraining the government. The only way to successfully defy the state is to build mass organisation of workers. We should not ignore the fact that the weakest flank of our movement is in relation to the trade union leadership. They are tied into the Croke Park deal and a leading spokesman has recently boasted that the unions have donated over €600 million so far this year to the bondholders through the agreement. It is in this context that SIPTU and UNITE executives call for the withdrawal of the household charge – SIPTU have said openly that this means that the government should collect the same amount of money through a less obvious mechanism. Again the only way to avoid this sort of betrayal is to organise workers in the campaign as workers, independently of the union bosses. What is the alternative? The alternative is a boycott the bailout campaign. That means a political programme that repudiates the bailout and the policy of bleeding Ireland dry, that proposes the seizure of resources and services abandoned by the capitalists, that looks to link up with other working-class forces across Europe, that organises tightly not only in the communities, but in the workplaces and unions, a movement that puts on the agenda a new leadership and a new party for the working class. The majority of the Irish Socialist movement argue that if we can strike a spark around non-payment we can ignite the mass resentment and anger that already exist in an explosion of resistance against the austerity. The responsibility of the socialists does not end with striking sparks. We also have to give a direction to the anger, a strategy and policy for victory. We have only to look at Greece, where mass mobilisations have led, not to capitalist retreat, but to the suspension of democracy and where a large and well-organised working-class movement is still struggling to orient itself and produce an effective alternative. The Irish explosion will come because the workers have no choice. No matter how much people cling to the hope that the austerity will lead to recovery, all the signs point in the opposite direction and to a second bail-out. Only the self-organisation of the working class can provide an alternative. The time to put forward that argument is today. 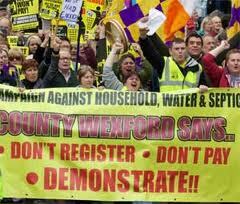 Posted on April 2, 2012, in Anti-household and anti-water tax, Economy and workers' resistance, Irish politics today, Political education and theory, twenty-six counties. Bookmark the permalink. Comments Off on The anti-household tax campaign – what politics are needed?.